It has been a while since my last post here, and i have been extremely busy for the most part of it. Since my last blog post i have fully revised and i also sat all of my exams. Over the few weeks previous to Christmas i was just so busy with work and college. I would be studying for my college exams and also working a 10 hour (at least) day too. I was extremely pushed for time, once i left work it was either, work – study – bed or work – bed – work. The cycle just continued for the whole month of December. Finding time to get onto the computer was rare, when i finally got a minute i just wanted to do some mindless browsing, no blog writing or anything that would take effort. I once found myself having so little time that i had to copy my notes for the next exam onto my phone just so i could give them a look at whenever i had a minute at work. I finished up work early on Christmas Eve and then had 3 days off to relax, and i enjoyed them as much as was possible, i just lied around the house. I am back at work again now and thankfully it is beginning to return to normality! It is still busy but nowhere near what it was like prior to Christmas. So i will be finding myself with more free time over the coming weeks and hopefully i can get something productive done with it. 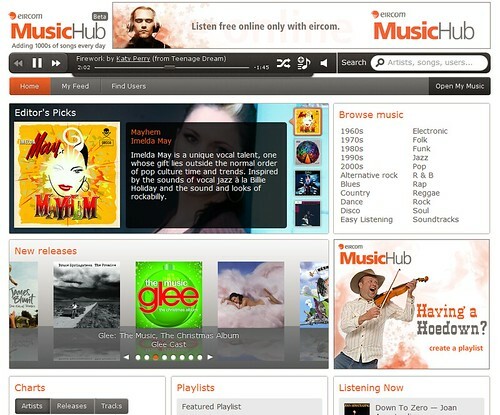 Yesterday Eircom released their new music streaming service, Eircom Music Hub, here in Ireland. There is not too many websites that allow for music streaming, at least not here in Ireland. If you are currently an Eircom customer then you can sign up with your account number and phone number and straight away start streaming music for free! The basic package for existing customers is free, it only allows for streaming, there are two other packages from €5.99 to €12.99, these include the extra benefit of being able to download so many songs per month, but I do not think it is worth paying because for €5.99 you still get the streaming from the free package and are only allowed 15 downloads, not a lot, but more than iTunes. 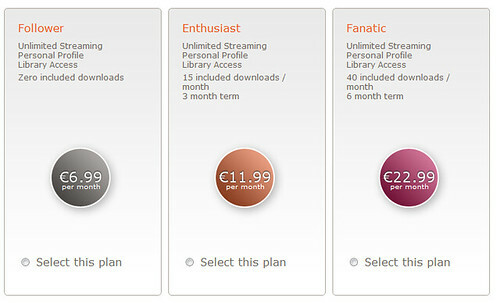 The second packages at €12.99 allows for 40 downloads and the free streaming service. In my opinion, if I was to use this service I wouldn’t pay for the downloads, if I am with Eircom, which I am, then I am more than happy with the free streaming service. 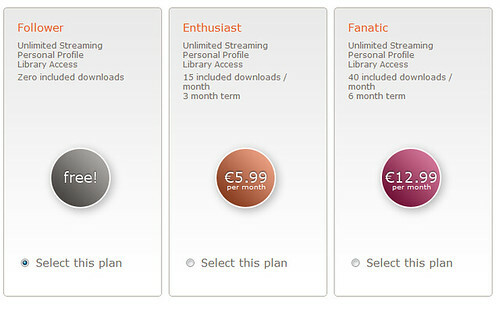 On the other side, if you are not an Eircom customer you can still use their new service, the packages begin at €6.99 for the unlimited streaming per month. Then €11.99 and €22.99 for the same packages I talked about for the current customers above. So I signed up for the service yesterday when it came out and it is pretty good. It is currently in Beta so they are still working on it and at the moment although there is a lot of music, they are still adding more. Most of the artists I looked up only had one of their albums available, but it is not a bad start for the first day it is out! It will be interesting to see how this service turns out, it has the current charts on the front page and also show some playlists that other users have made, also you can see what others are listening to at the moment. I like that you can navigate to other pages and the song keeps playing. The design is nice too, when you scroll down the page the music player will always stick to the top so you can always get to the pause and volume controls if you need them. There are a few things that it could benefit from, the first is that if you try to close the music hub’s tab/window that it shows a message warning you that the song will stop, this is just like the feature that GrooveShark has, people sometimes forget that the song will stop! Also if you could have some sort of desktop version it would also be nice or even a plugin for your browser so that you can control the player without having to go back to the Music Hub page, there is a plugin for Google chrome that someone made for GrooveShark and it works really well. So at the moment if I was to choose between the two, I would actually probably go for Eircom’s service. Why? To be honest the interface is a million times better than GrooveShark, I find it easier to navigate and find what you are looking for. If you have an Eircom account and haven’t tried it out yet, then head on over to the MusicHub! Like I said in my last blog post, I have been putting web design on the shelf over my last semester. But since getting the flare back after creating my Christmas design here on my blog I thought I would have another go at a bit of web design. This time I am working on a design for my portfolio, I want this site to not only showcase some of my previous works, but also to provide a place where people can contact me for some web design. 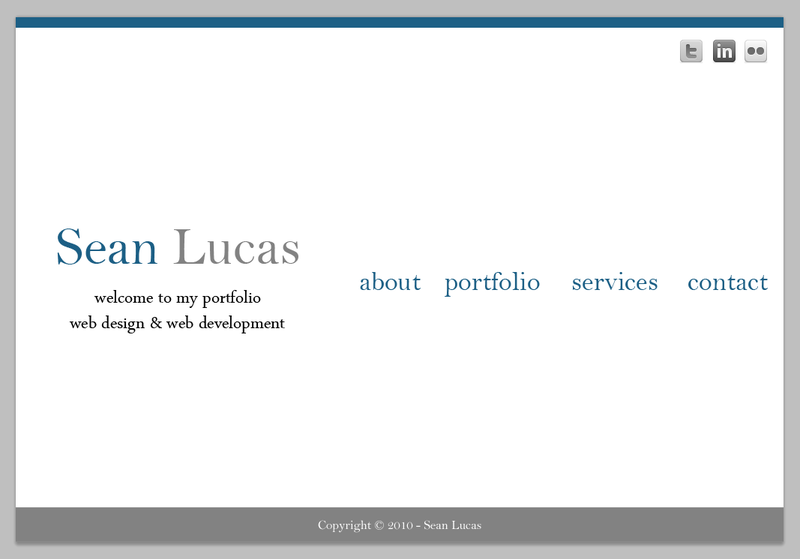 I have really got into the simplistic look for websites as of lately, less is more! Like this blog, one main colour and it has a big impact, or at least I think it does 😉 So with this in mind I set out to come up with my portfolio design. It is always a long process of deciding how exactly you want to make it look, do I want the navigation links on the top? bottom? or middle? the decision is difficult at times and easy on other occasions. This time it took me a while to settle with my decision, I have finally decided to have them in the middle. Here is a look at how the design looks at the moment (click for a bigger version! ), I have ideas on how I will get the pages to appear, so the links will have some movement when pages are shown. I think I might use the design for my business cards that I want to get made. So for now the design is just a design, I have yet to make any code for it, but I think I am happy with it so the next step is just to code it, I will get this done over the Christmas break, it’s unlikely I will before then because of my college exams. Ever since I first deigned my new theme for this blog, I always saw the potential that I could easily make small changes that would have a fairly big effect, like this new Christmas theme, it is the same as my old one, just with some tweaks, mainly the addition of the colour red and some small Christmas pictures in the header. It only took me about 30 minutes in total to make the design and then to get it implemented, to change it, I just downloaded my current theme, changed a few values in the style-sheet then put it back up onto the server and activated it in WordPress. Since I designed the original theme myself, I think it helped because I knew how it is structured and I knew what I could do easily. 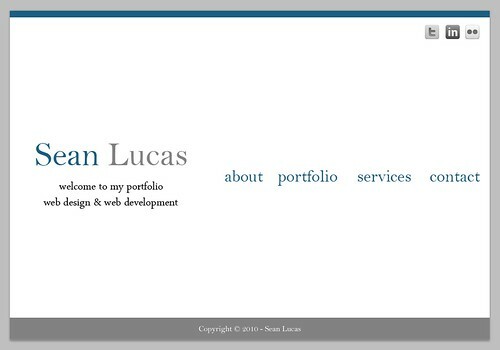 Over this semester in college I seemed to put web design to the back of my head, it just seemed like I had too little time to sit down and make a website. So I wanted to do something for Christmas! I used to get irritated with Christmas, at least over the past few years. That was because of my work, every year we have Christmas for about 2 months and the most annoying kind of Christmas music (no lyrics), and it really would take the fun out of the holiday. But for some reason this year I feel completely different towards it, I am really looking forward to the break from college and my 2 whole days off work (they really spoil us!). So I put this design up Friday, I didn’t have time on Thursday or Friday to talk about it, I just wanted to put it live! I had the theme finished over a week ago, I was just waiting for December to begin before I put it live.